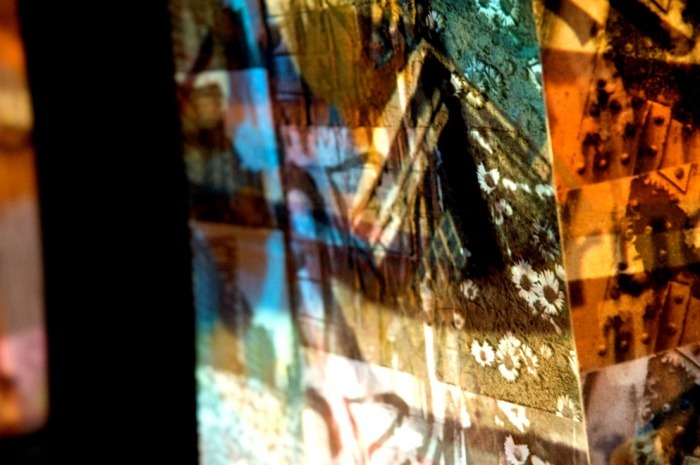 Between conception and realisation, research and tests are an important part of the creative process which not only ensures timely delivery of proposed projects but also frequently 'weeds out' practical problems and reveals opportunites for improvement. 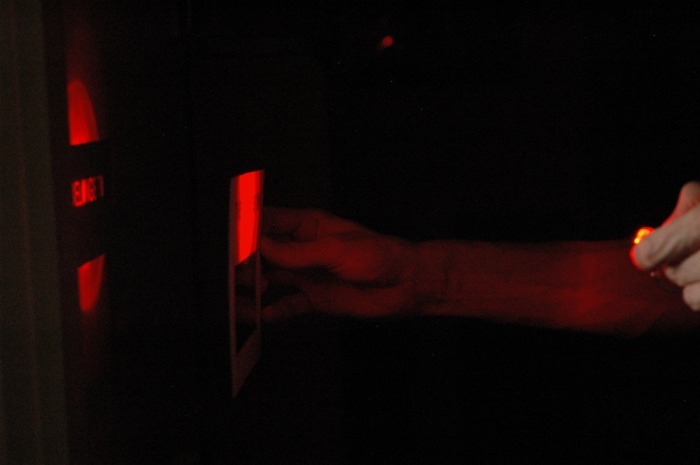 The selected images on this page illustrate a few outcomes of those practical trials and a brief narration explains the background to some of the featured projects. 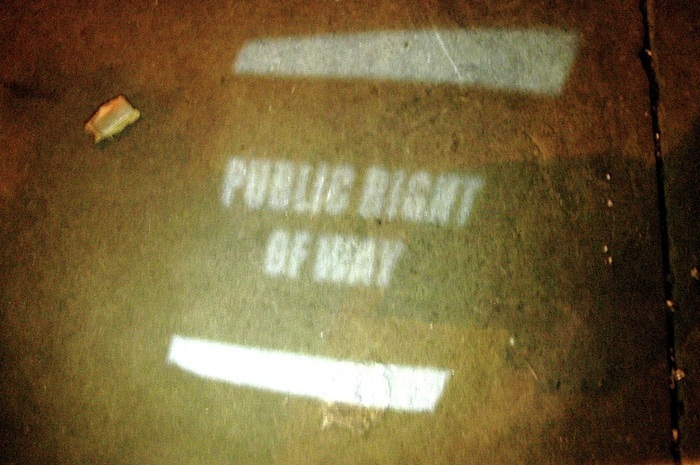 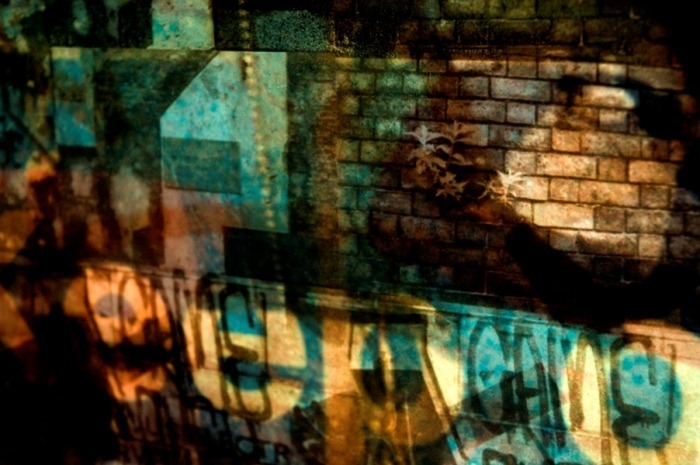 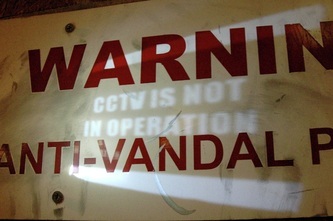 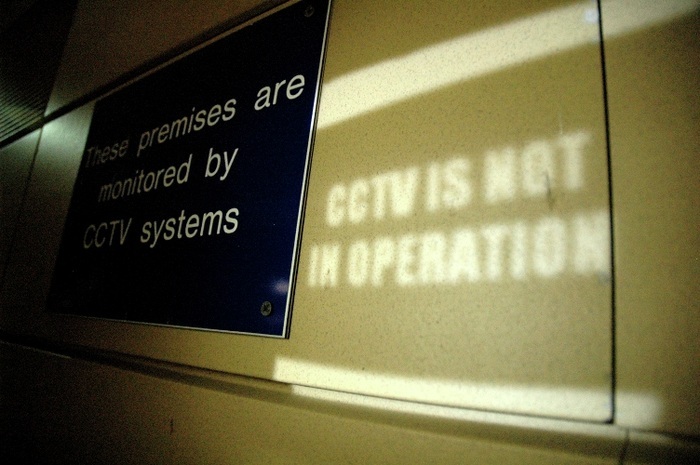 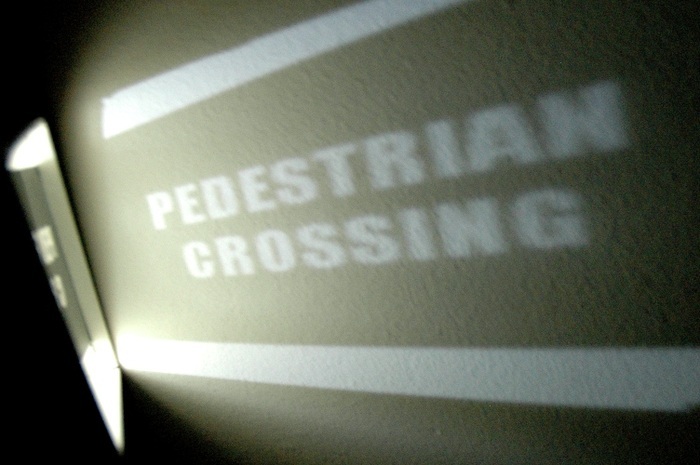 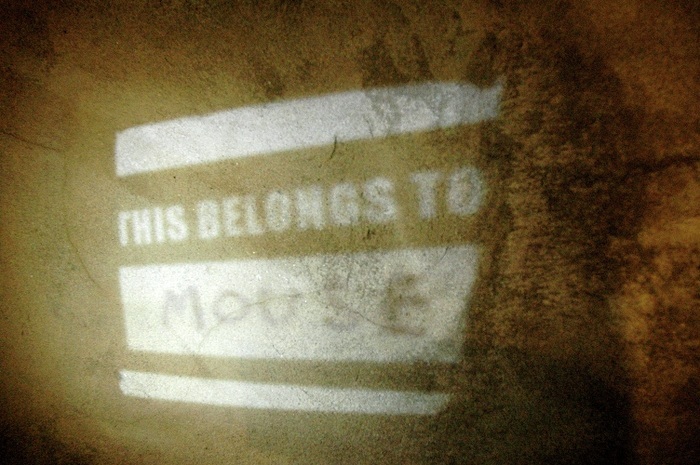 In preparation for Alternative Party 2010, consideration was given to potential methods of encouraging interaction with projections, including ways in which participants could leave traces of their interventions without precluding others from doing the same. 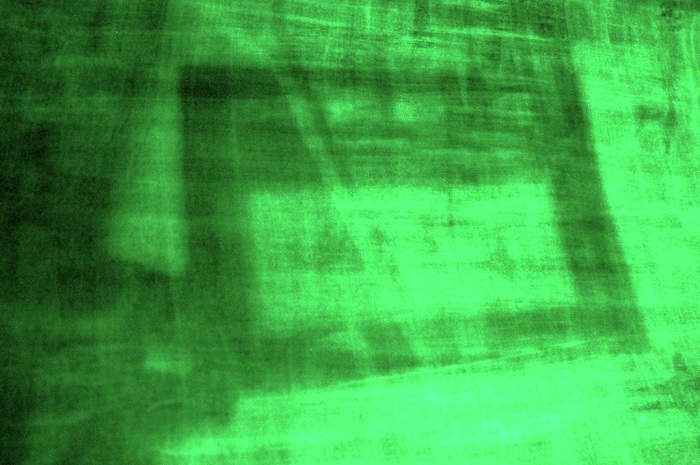 Use of phosphorescent paint in these trials attempted to achieve this, as well as lending interesting new qualities to the visualisation of images and video. 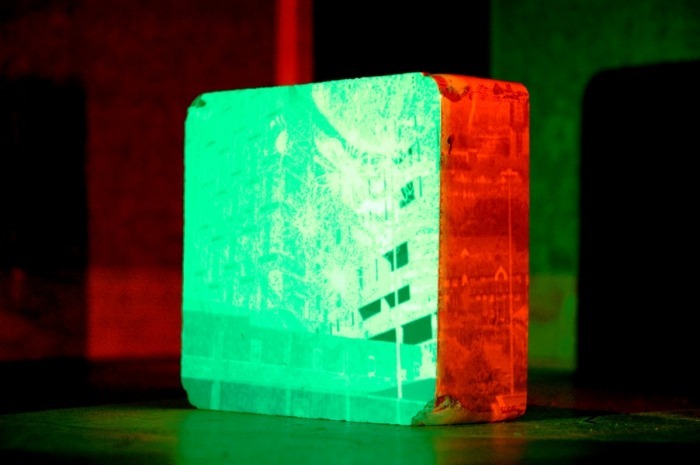 When a projection is cast onto a surface treated with phosphorescent paint it leaves a 'shadow' or trace which remains for some time when the light source is switched off or the image changed. 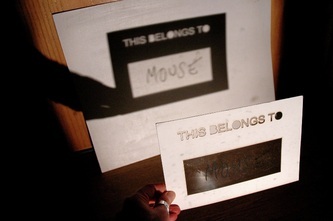 The inclusion of this substance also potentially changed the nature by which This Belongs To cards might be used with the installation. Unfortunately, despite successful trials, the physical set up of the installation in Helsinki did not permit the use of the paints as the scale of the space and power of the projectors could not reproduce test conditions. 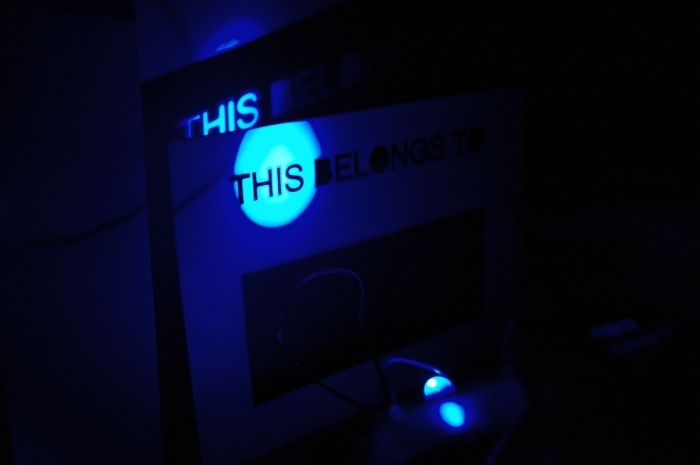 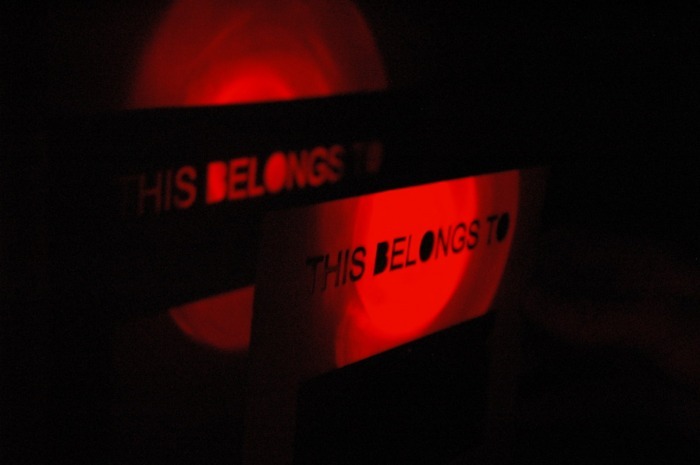 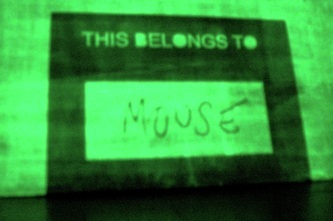 Glittermouse was pleased to participate in the TINT Arts Lab first season of residencies in June and July 2010 with a project that proposed to achieve an electronic development of the This Belongs To card , which would utilise LEDs to allow use at night or in lower light conditions. 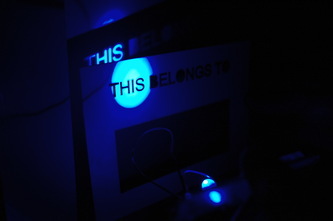 Tests with LEDs and a This Belongs to Card (see below) raised problems relating to distance of light source from the card and focus/clarity of shadow which necessitated a change in the format of the design for the initial proposal. The final realisation of the developed object was completed in time to be part of the Space Invaders installation at Alternative Party 2010. Though the light was not strong enough to interact with the projections in the installation, it was successfully used to claim areas of Helsinki in a night time wander of the city. Developments of the project outlived the lifespan of the residency and following a range of trials including a series of lenses and different types of LED, a prototype was eventually realised in September 2010. Additional developments included interchangable 'slides' referenced ongoing research in to related issues such as Shared Space and public fear of crime. 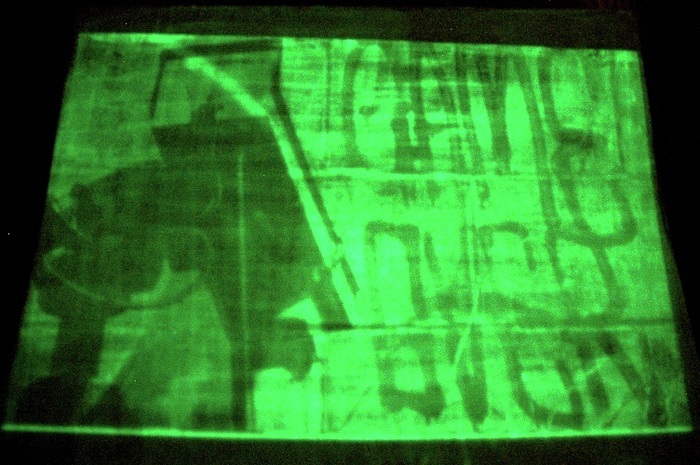 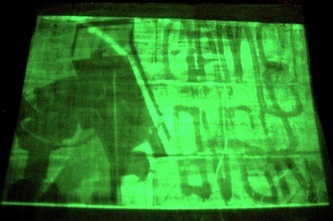 Experiments continued with laser etched objects to include use of projected Digital Video, allowing for a higher quality of projected image. 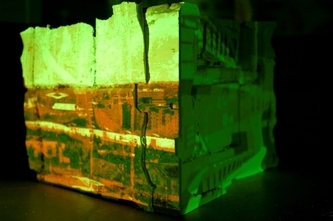 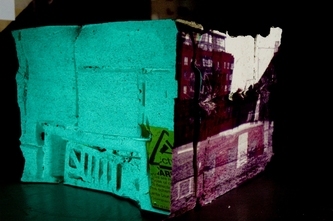 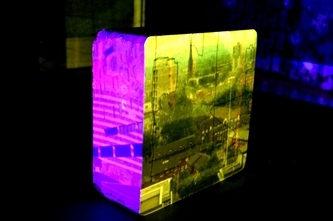 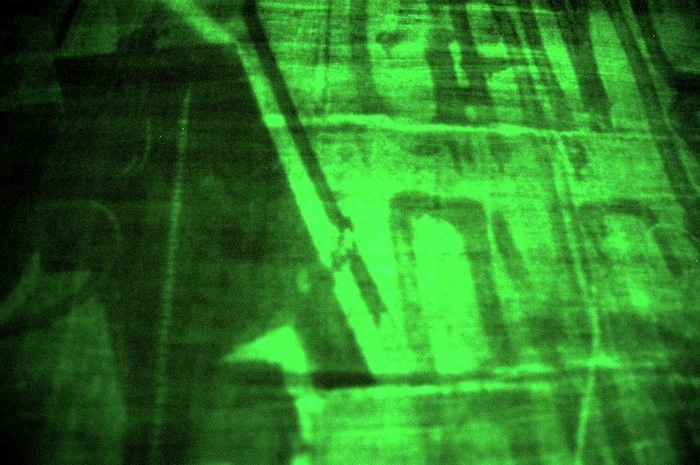 Simultaneous shots of the same street captured at right angles to one another are lined up and projected onto the etched object lending additional three dimensionality to solid objects (such as buildings) while passers by appear to walk across the field of view without the distortion that would occur using one projection onto an angle. Continued use of slide projectors realised a contrast between still and moving image, reflecting an ongoing discussion of permanence and transience and 'filling in' the shadows cast by the object in the projection of the digital video. These experiments with laser etched MDF to produce further textured surfaces, found that this method allowed a greater flexibility with images as well as being much lighter and more practical to work with. 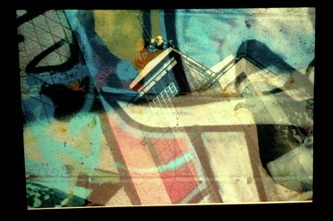 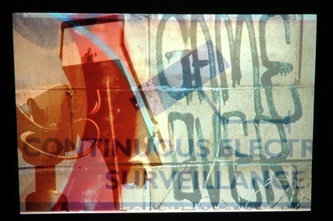 These trials also included the utilisation of analogue slide projection as an alternative method to digital projectors. 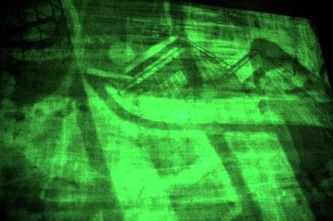 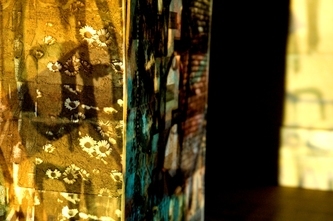 In these images, digital images have been transferred to transparency and projected onto the laser etchings. 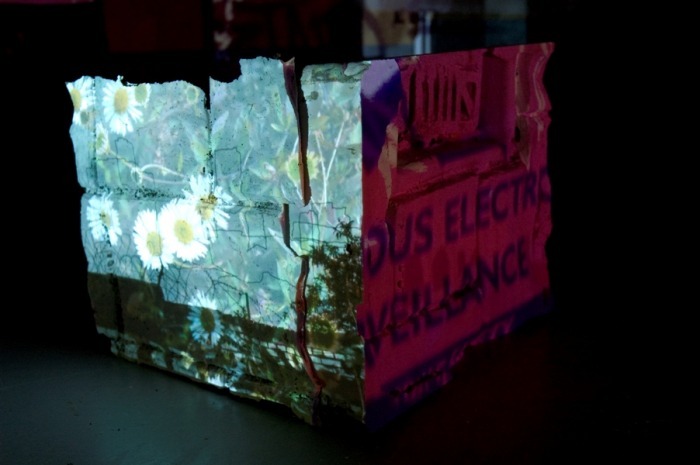 This negated the need for the availability of a laptop during exhibiton, potentially reducing equipment requirements and costs. 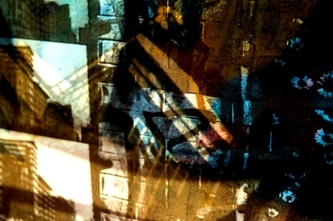 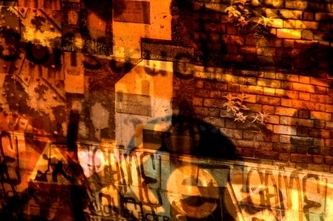 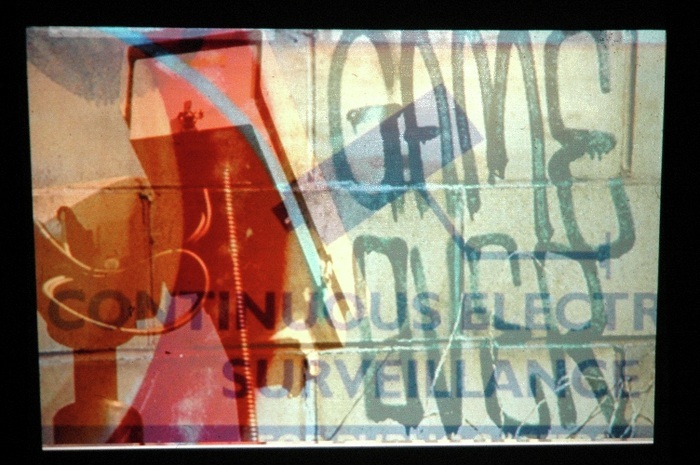 Following on from drawing installations involving projected images of the urban environment, this series of investigations aimed to develop the use of space and surface. 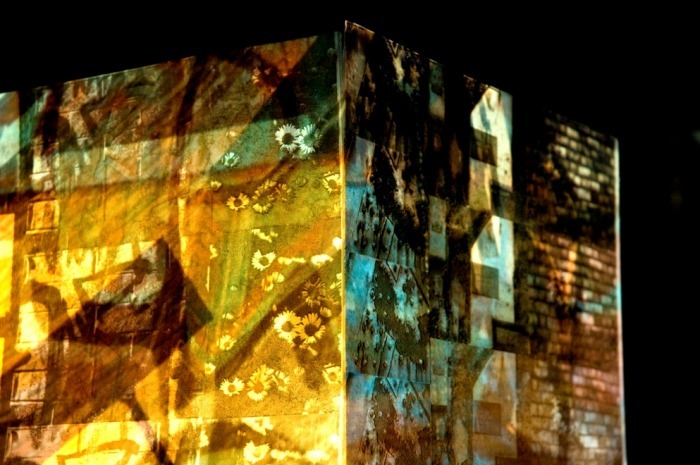 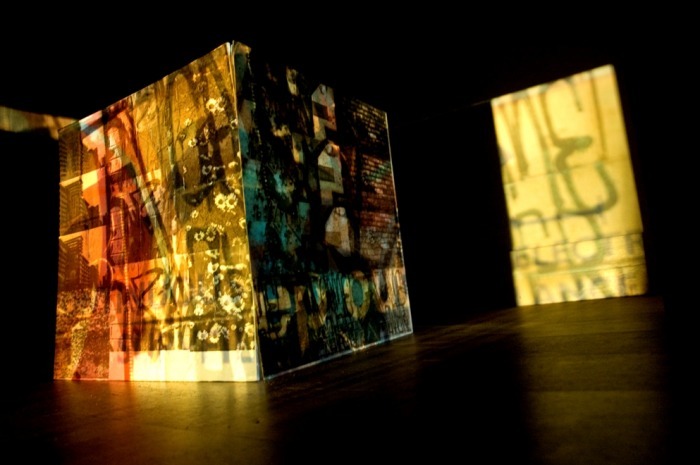 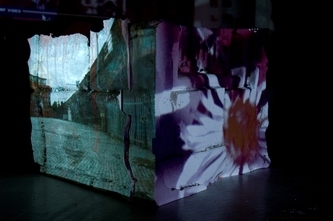 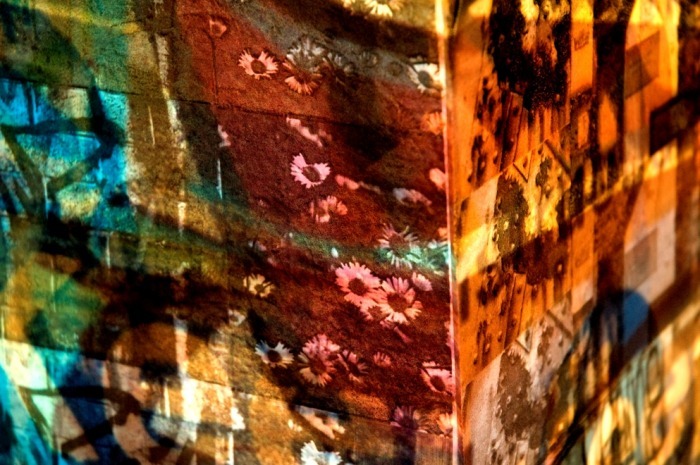 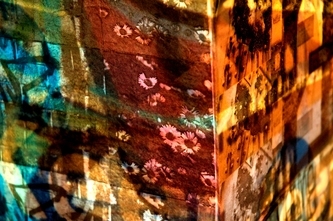 These images show experimentations using multiple projectors to cast simultaneous images onto different sides of plaster blocks. 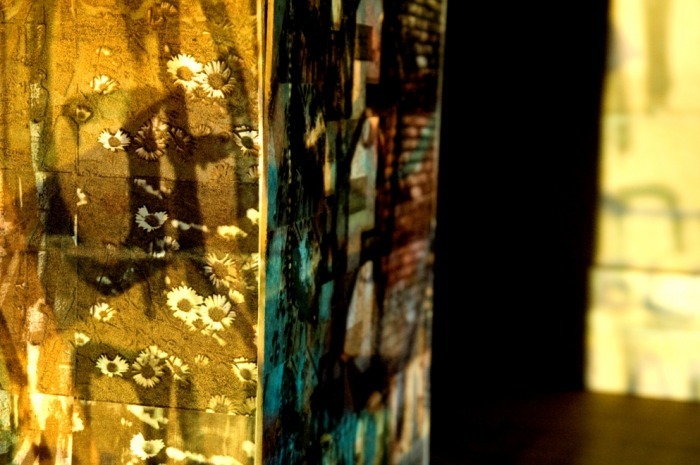 Casts made directly from surfaces in the city streets such as pavements and drain covers have also been used to produce a textured surface to project onto. This brought in an additionally illustrative layer aside from the projected image and any drawings made on to the surface, also referencing the transient and palimpsetic nature of city spaces.